The 2013 Easter Jeep Safari was very much different from several Easter Jeep Safaris that took place in the past. This year Easter Jeep Safari took place in the end of March, thus we could see that even there is a change from the usual date when the Easter Jeep Safari used to take place previously. Jeep takes huge measures to know the public and the journalist’s opinion. For measuring the public and the journalist’s opinion every year Jeep produces new products and also brings new toys in the market. Except jeep, there are no other automakers in the market which does the same thing for measuring the public and the journalist’s opinion. Usually jeep enters the fray every year along with their engineers, PR and their designers, few journalists also accompany them. Some of the concepts and prototypes that are released by Jeep every year are very much different from the usual types. Speaking on a true scale, it seems that these types of prototypes and concepts can never be produced in the future. Some of the good examples of these exceptional concepts are the Mighty Jeep FC Concept from the last years Easter Jeep Safari and the most favorite of most of the people, the Jeep J-12 Concept. It is impossible to legalize Mighty Jeep FC Concept with the IIHS, DOT, NHTSA and the ASPCA. This year’s Easter Jeep Safari was very much different because whatever Jeep brought was easily attainable. Also in this year’s Easter Jeep Safari most of the models were ready for production. Pietro Gorlier, the brand president and CEO said that these bizarre concepts are quite funny. He also added that he knew that most of the fans became unhappy when they came to know that the vehicle of their choice can never be built. So, the new designs that were made at the Chrysler advanced design can be easily attained. The media were provided with six vehicles to drive through the UT trails and the Moab. There were also three vehicles present that provided a glimpse of the future concepts. There were also more three jeeps present that were built with test components, Mopar accessories and the prototype components. These jeeps were made available for testing the reaction of the public. Some of the concepts in 2013 Easter Jeep Safari are namely the Wrangler Mopar Recon, the Wrangler Stitch, the Wrangler Sand Trooper II, the Grand Cherokee Trail hawk II, the Wrangler Flat Top and the Wrangler Slim. 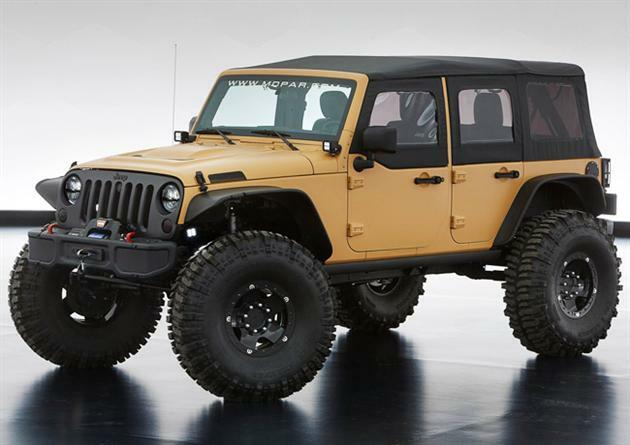 The Wrangler Mopar Recon is a massive HEMI. It has got a prototype bumper and a suspension lift. The Wrangler Stitch is like a little rocket, it is so light that it can be easily compared with a Suzuki samurai. The Wrangler Sand Trooper II is just an update of the previous Wrangler Sand Trooper. The Grand Cherokee trail hawk II is the best model among all proposed models. The Wrangler Flat top has got a modified top and has proved its capability as an off-road jeep. The Wrangler Slim is one of the most realistic Wrangler model. It has got an aero bumper that gives it a fantastic looks.